Sustainable alternatives to the Big Three are getting easier to find--and tastier. 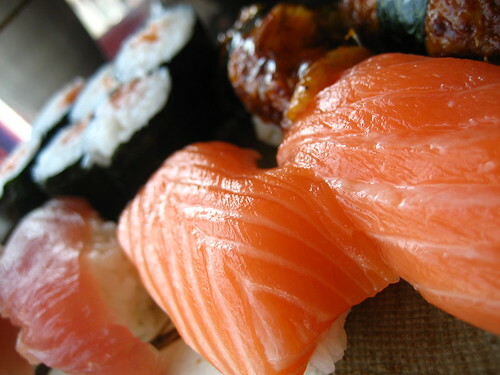 At Moshi Moshi, a chain of sushi bars in London, diners can opt for eco-dishes like seabass sashimi and prawn nigiri. At San Francisco's Tataki Sushi & Sake Bar, patrons stand in line for as long as two hours for the restaurant's famous "faux-nagi," sablefish seared and brushed with a sweet, sultry sauce that mimics the taste of the ever-popular (but unsustainable) unagi, or eel. In Portland, Oregon, Bamboo Sushi serves fish with a Marine Stewardship Council stamp of approval. The council okays sea creatures including haddock, halibut, hake and herring (and that's just the H's). And as for that awesome (and depressing and -- at least it should be -- behavior changing) chart? Ladies and gentlemen, I give you the noble bluefin tuna's great and tragic disappearing act. Not much room left on the y-axis, folks. If that won't stop you from eating bluefin tuna, I can't imagine what will. and I forwarded your article to them. Thank you for making your readers aware! We just planted a garden too! With the help of Victory Gardens! My oldest daughter and her hubby used to live in Penn. She worked at Reegers Farm. A registered dietician, she now has Roots. You can say I'm a proud Mom. My chilcren have taught me so much and I'm still learning everyday!